PlayOJO casino may be a new brand in the world of online casinos but OJO has changed the game for the fairer. PlayOJO is the fair casino, at PlayOJO we pride ourselves on offering a fairer proposition to players. OJO is the very first online casino in the industry to not have any wagering requirements whatsoever. This means casino players have complete peace of mind when it comes to their money, whatever you win is yours to keep with no restrictions. You never need to worry about some hidden term or sneaky small print keeping you from your money. OJO gives the players back control! The online casino industry has long been using wagering requirements and other bonus restrictions to keep players from withdrawing their money. Well, OJO says no to this. As a fair online casino, PlayOJO doesn’t have traditional bonuses with restrictions. OJO only offers real money rewards so everything is paid in cash, upfront with no hassle. PlayOJO is the only online casino that gives all players money back on every bet, win or lose. This exclusive OJOplus feature puts a little bit of money into an OJOplus account (separate from the real money balance) every time you place a bet. Money back can be earned on every game including slots, live dealer games and progressive jackpots with no restrictions. This free money can be moved to your real money balance with a simple click, then you can play it or withdraw it at any time. Because OJO gives you free money on every bet, it gives players a better RTP (Return to Player) percentage. So, why wouldn’t you play with OJO? 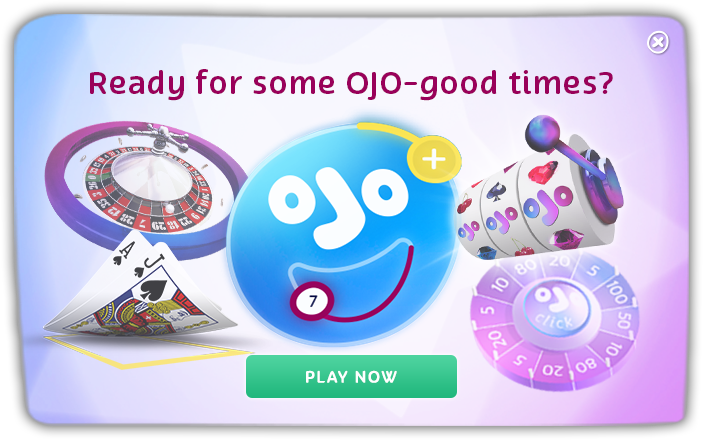 OJO the fair online casino likes to rewards players with Free Spins. All of OJO’s Free Spins are completely fair, fair spins! OJO’s Free Spins have no restrictions, so you can play your Free Spins with no maximum win limit, so you could hit the jackpot! Then you can withdraw all your winnings in cash with no problems. Fair play! PlayOJO.com is the fairest casino online. OJO is changing the casino industry for the better and paving the way for fair casino play. What you see is what you get with OJO, everything is clear, simple and fair. When you join OJO’s world of play you get up to 50 Free Spins on your first deposit with plenty of rewards to come after that. OJO SAYS PLAY ON! SHOWERS WILL NEVER BE THE SAME AGAIN!